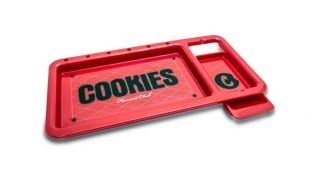 File image of the Cookies Rolling Tray available at a new store to open in San Francisco. Local rapper and weed entrepreneur Berner has opened a clothing and lifestyle store in San Francisco. Cookies, located at 1423 Haight Street, had the first of three grand opening celebration days on Friday, May 15, and garnered long lines according to Hoodline. Berner, born Gilbert Milam Jr., is a cult figure in marijuana culture in the Bay Area and beyond. The publication noted that he is "well known for his association with the Cookie Family marijuana geneticists — among their strains are 'Girl Scout Cookies' and 'Sunset Sherbet.'" Berner is also a touring recording artist signed to Taylor Gang, the label run by hip-hop star Wiz Khalifa. Among the style innovations available at Cookies are lunch bags, duffle bags and a backpack said to be "smell proof."